Juzou the Drunkard is one of bigger bosses at the beginning of the game, and it can get frustrating when you are dying to him time in time again. By utilizing your surroundings, you can make this hard boss fight not so hard. Before you enter the battle with Juzou, you would want to make sure you have all of your Healing Gourds are full. This way, you can stay in the fight for the longest, even if you take a few hits. You would also want to have a stack of around 15 ninja stars in your bionic hand. After you have this, make sure that you make it to the building near Juzou without taking any damage. This can take a few tries, but the reasoning behind this is so that you can use maximum healing during the fight. I know that I used all of mine. Than, you must take all of the enemies except for Jozou, obviously. My best strategy to not take any damage while doing this is to go up and kill one of the enemies, than run away until the fight music comes back. You can do this until nobody is left but Jozou. At this point, he should have his back turned to you. You should sneak up behind him, and land a stealth attack. At this point he will have noticed you. Run over to the right, near the first rock. Unless he has died already, there should be another shinobi. Talk to him and skip all of the dialogue. You guys will run into the fight together. He will distract Jozou while you take out about 33% of his health bar. Next, you should lock onto Juzou and sprint away from all of his attacks. Whenever he goes to take a swig of his poison drink, go up behind him and do this. 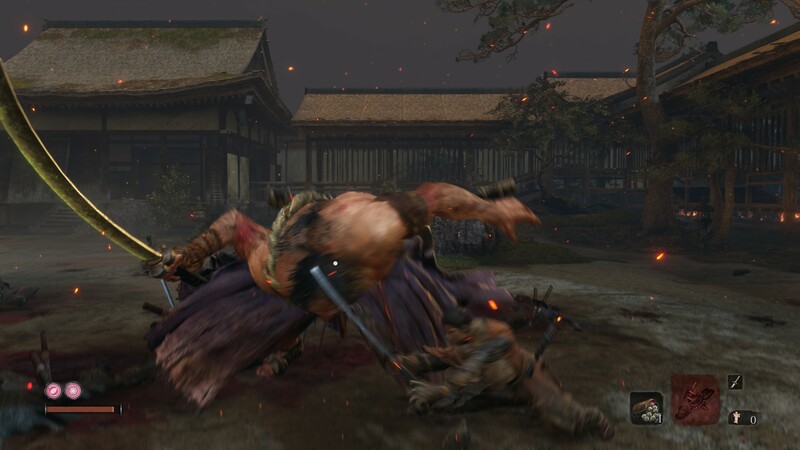 Also do this whenever the belching animation which poisons his katana begins. From my experience, Juzou will continue repeating this cycle until he is at low health. At that point, stay clear of his attacks and fire all of your ninja stars at him. At this point, he should be down on the ground. Go up and swing your sword for the killshot. Even though you have beaten one of the harder early bosses in the game, don’t celebrate for too long. Very soon you will have to fight Lady Butterfly, who has caused me and many others some major issues.